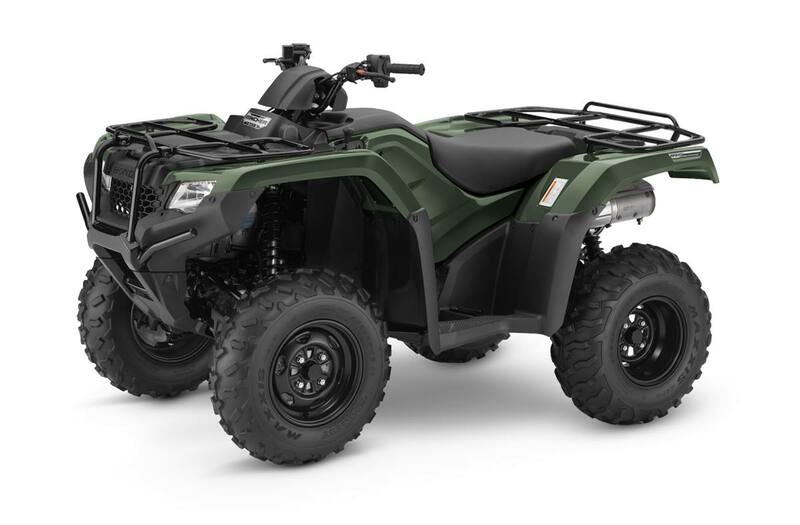 Maximum efficiency: Rugged OHV liquid-cooled, fuel-injected 420 cc longitudinally mounted engine allows direct driveshaft alignment to both front and rear wheels for maximum drivetrain efficiency. Improved ground clearance: Overhead-valve design provides compact engine dimensions for improved ground clearance while maintaining a broad, easy-to-use powerband. Quality engineering: Stainless-steel exhaust system includes a USDA-qualified spark arrester/muffler designed for quiet operation without servicing for long-lasting performance. Rubber-cushion engine mounting and gear-driven counter-balancer reduce vibration. Easy start, fuel efficient: Convenient electric starting, with an automatic internal-decompression system, gets you going quickly. Programmed Fuel Injection (PGM-FI) system improves power delivery and throttle response, and increases fuel efficiency for extended range. Excellent drivability: Super-heavy-duty automatic clutch with low-rpm engagement provides excellent drivability and towing capacity. Convenient selector: Handy 4WD/2WD selector lever, mounted on the left-front panel engages 4WD when needed for the tough stuff and 2WD when conditions allow. Advanced DCT: Automatic Dual-Clutch Transmission (DCT) provides the compact size and strength of a manual transmission with the convenience of an automatic transmission (plus no belts to slip, break or burn out). DCT features a dual-shift mapping program that automatically selects between two transmission shifting modes—either Cruise or Sport—for optimum shift timing depending on the rider’s pattern of throttle operation. During aggressive use, the Sport mode kicks in and holds the transmission in gear longer before shifting to deliver more aggressive performance. During more relaxed operation, the Cruise mode allows the transmission to shift up sooner for more casual performance and enhanced fuel efficiency. 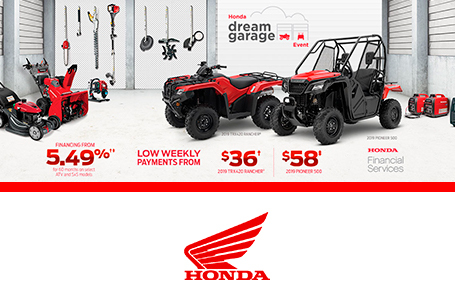 In addition to the fully automatic mode, the DCT transmission also allows riders to employ Honda's exclusive Electric Shift Program (ESP) for easy shifts with the touch of handlebar-mounted buttons. Powerful output: Powerful AC generator has ample capacity with 450 watts of output. Smooth ride: Durable double-cradle steel frame developed with Computer Aided Engineering features increased stiffness for precise handling and a smoother ride. Double-wishbone independent front suspension offers generous, well-controlled travel, providing a sense of security and control over difficult terrain. Dynamic suspension: Independent rear suspension (IRS) design with lower A arms and upper I arms features optimized stiffness for improved handling performance. Comfort is also enhanced with longer travel. Adjustable spring preload featured on all shocks allows suspension to be tuned to match varying loads and riding conditions. Generous ground clearance: Generous ground clearance of 233 mm (9.2 in.) lets you ride over rough terrain with ease. Tough 24-inch front and rear tires provide excellent ground clearance while maintaining precise handling. Precise power steering: Electric Power Steering (EPS) provides reduced low-speed steering effort for enhanced maneuverability and decreased kickback for improved all-around steering action. A three-point mounting setup for the EPS system makes the entire steering mechanism more rigid for precise steering, tighter turning radius and excellent manoeuvrability. Durable design: Plastic CV joint boots are durable and tear-resistant, with sealed steering knuckle bearings for extended durability. Stopping power: Inboard rear disc brake is mounted on the rear driveshaft, reducing unsprung weight and keeping the disc out of harm’s way in rugged conditions. Large 190 mm dual front hydraulic disc brakes offer impressive stopping power. Extra protection: Durable bodywork offers excellent mud and debris protection. One-piece tank/side cover allows easy access for maintenance with no tools required. All-day comfort: Wide seat has thick padding for improved comfort. Tow ready: Heavy-duty trailer hitch.